Guo told that if he is selected in the primaries, he will serve as the KMT's presidential candidate. 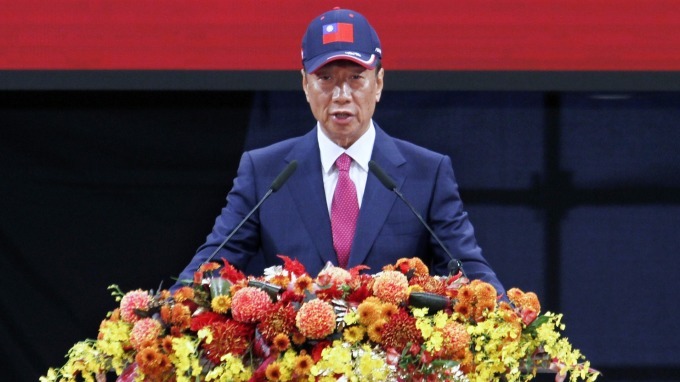 Hon Hai (2317-TW)’s chairman Terry Guo announced today on April 17th that he is officially entering the race for 2020 Taiwan presidency by taking part in the KMT presidential primary. However, he reiterated that he is willing to participate in the primary election but is unwilling to accept taking an unopposed appointment as the party's candidate. After visiting the temple of Chinese sea goddess Mazu and Chinese deity Guan Yu in the morning, Guo rushed to the KMT and received an honorary certificate from KMT Chairman Wu Den-yih. In Guo’s speech, he pointed out that he is willing to participate in the primary election but is unwilling to accept taking an unopposed appointment as the party's candidate. Gou said that if he is selected in the primaries, he will serve as the KMT's presidential candidate in 2020. However, if he is not chosen, it just means he did not put enough effort in and he will support the party's choice. He also stressed that KMT should have a fair, just, transparent and grounded primary election system. This morning, Guo went to Ci-Hui Temple in New Taipei City's Banqiao. After the visiting, he told that Mazu told him that 2020 is very important and encouraged him to come forward to support peace across the Taiwan and he will definitely follow the instructions given by the sea goddess Mazu.